The love and trust deep-rooted in a tight-knit family can create bonds that make running a business easier and increase its chances of success. “The big boss went to a customer’s house and will be back in no time” said Khaled Al Afeer. The big boss, is Khaled’s daughter Haneen, who is behind the transformation of their family business. 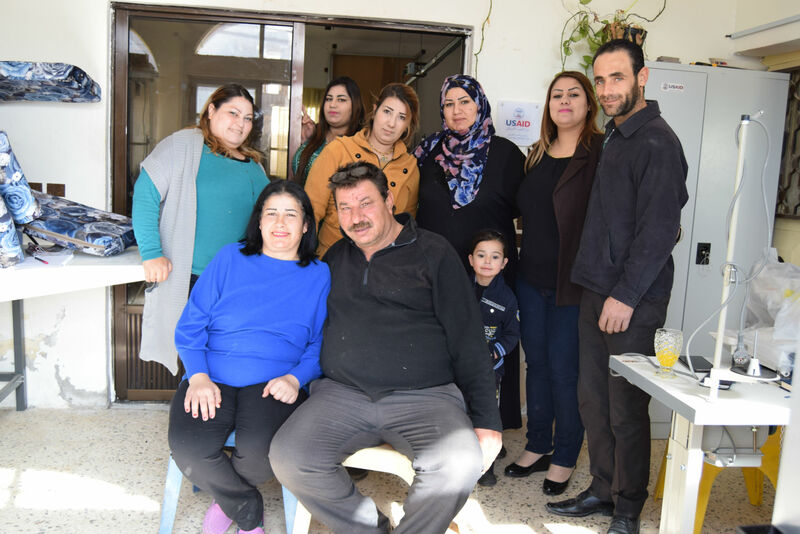 Khaled El Afeer, along his wife Hayat, and their four daughters Haneen (23), Marina (27), Mariana (25), and Farah (19), operate the Afeer Tailoring Shop from their home in Azraq city in Jordan. According to Khaled, two industries will never go out of business no matter how far technology advances; food and fashion. “You will always have a piece of clothing that needs fixing, curtains that need modification or even old furniture that could use some reupholstering”. His wife Hayat, a self-taught tailor who started working in the field at a young age, has always wanted to start a tailoring business from home but never had the resources to do so. “His Majesty King Abdullah visited our town a few years ago and gave money awards to local families. With the money, I bought our very first sewing machine and started offering clothes alteration and repair services from home to family and friends. Business grew little by little every day, and whenever I had enough money to buy another machine, I’d buy one”. Two of the Afeer daughters are differently-abled, which makes it difficult for them to find regular jobs due to their limited mobility. So they learned the profession to help out their mother with her tailoring business. However, the family only had a few old machines which limited their work and held them back from expanding. 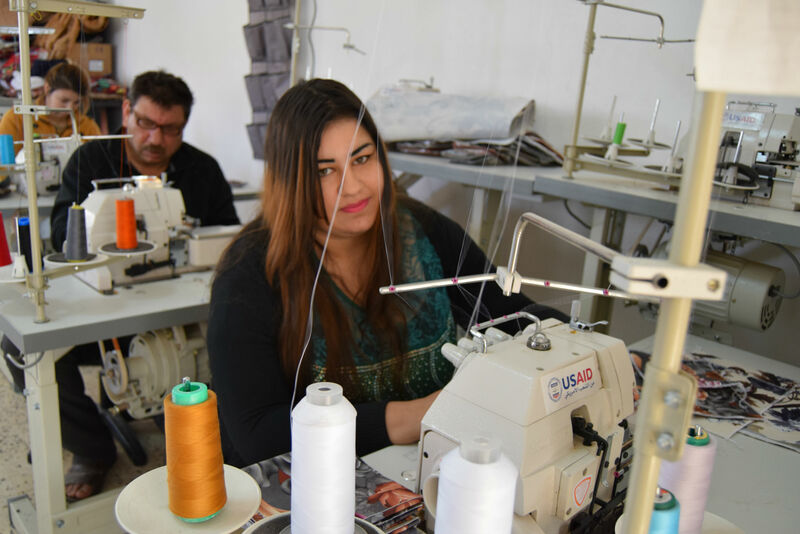 Haneen Al Afeer applied for a grant from the USAID Local Enterprise Support Project (LENS) to be able to purchase more tailoring machines and support her family’s business. And now, a few months later, her entire family became involved and dedicated to working in the business, including the husbands of the two daughters. “I just graduated high school and obtained my diploma, but looking for a job was completely out of the question for me because any job out there requires some level of movement. I couldn’t ask for anything more. I get to work with the people I love the most and get paid for it”, says Farah. 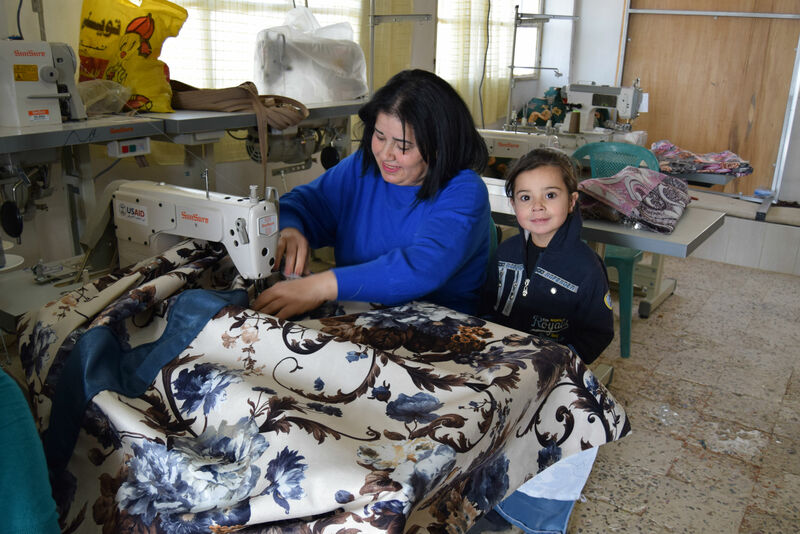 As the only business in Azraq which provides a full range of tailoring services, Al-Afeer tailoring workshop is finally able to meet demand after upgrading their machines and increasing their number. Their monthly revenues have increased by over 45% as well as a result of the grant tells us Haneen. “The first thing that we do with our monthly revenue is pay the bills and take care of important household expenses. After that we all get paid according to the hours we’ve put in that month, and then we use the money left for buying fabrics and equipment for the workshop”. “What used to take us 8 days to finish is now ready in a little over a day. We can upholster an entire set of couches overnight. We’re a great team and we genuinely have our family’s best interest at heart. That’s why it works so well.” says Hayat. 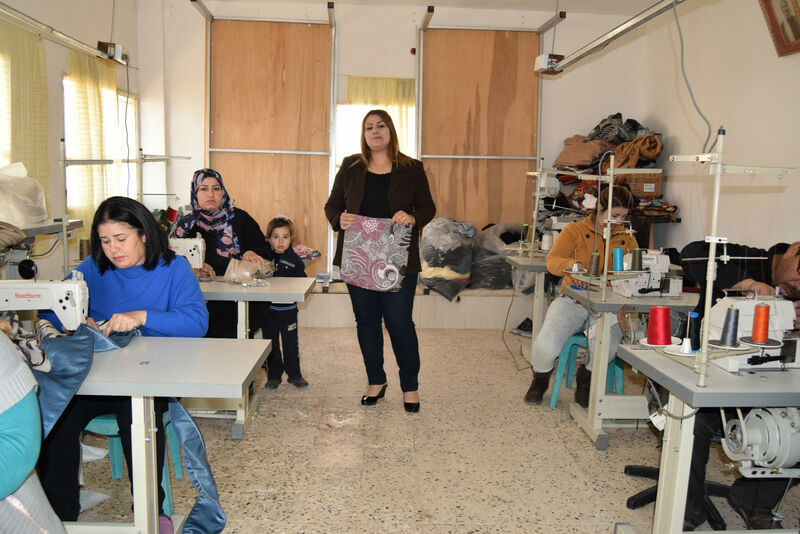 Al-Afeer tailoring workshop is also creating change in the community, where it is not acceptable for most women to work or even deal with men on their own. “Most of our work with furniture requires house visits, so it’s a lot more acceptable for women in the local community to invite a woman instead of a man to your home to take measurements. My daughters’ careers started in this little tailoring workshop, and I’d like to offer that to other girls in the community by allowing them to work here. Hiring women is definitely something we’re planning to do very soon”, added Hayat. There is something quite special about the Afeer family. Something about their bond and their passion makes you want to sit there for hours and listen to their stories. “Work can get crazy and we sometimes have to stay up till 2 or 3 in the morning to meet a deadline, but it never feels like work, especially that our husbands are also around to help out. It’s a family project by all means; one that is very special and dear to our hearts” said Mariana Al Afeer while holding her 4-year old daughter Nida.